Experimental and LSA pilots know that they have the most technologically advanced GA aircraft flying. SkyView continues that tradition with the next generation of glass panels, offering redundant networks and systems, incredibly bright screens, design flexibility, and future upgradability unsurpassed by anything else flying. Advanced Screens: Very bright, high-resolution screens driven by advanced graphic processors create highly visible and readable displays. Screen resolutions are 1024x600 for the SV-D1000 10” and 800x480 for the SV-D700 7”. Brightness is over 1350 nits for the 10” display and 1200 nits for the 7” display. Displays are fully dimmable for night flight. A wiring harness included with each display makes for easy connections between displays and modules. Integrated User Interface: Two multi-position joysticks (left, right, up, down, diagonal, push, and rotary) offer easy and intuitive control of your SkyView displays. EFIS, EMS, Autopilot, Moving Map, 3-D Terrain/Synthetic Vision, and menu structures are all available with less than three button presses. Flexible User Interface: The default screen setups are logical and functional, so you can start flying with a minimum of setup time. But as you determine your preferences and screen layouts, the displayed data can be configured in ways that work best for you. ADAHRS Module: The SV-ADAHRS-200 is a complete MEMS-based attitude reference and air data computer, integrated with a digital compass. This allows easier mounting and higher accuracy calibration between the system components. One or more SV-ADAHRS-201 Modules can be added to a SkyView System for redundancy. ARINC 429 Module: The SV-ARINC-429 makes SkyView compatible with certified GPS receivers, integrating with such radios as the Garmin 430/530. This includes advanced features such as GPS steering, CDI auto-scaling and vertical guidance from WAAS-enabled GPS receivers. This Module also enables the full suite of G430/530 VOR and localizer functionality. 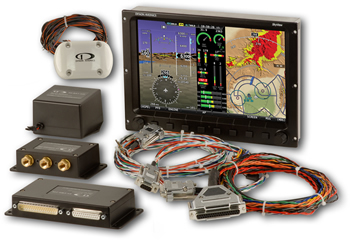 Compatibility: Your existing Dynon engine monitor sensors and harness will work with the new SV-EMS-220 Engine Module. Your existing Dynon Servos will work with the SkyView system, including a redundant network connection. Your existing Dynon pitot probes will also work with the SkyView system.